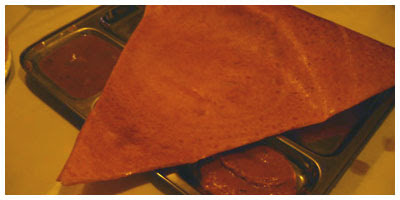 The meal starts with a quote on the front of the menu: "Spice up your life: Dip the dosa." It is a good beginning for the feeling this pan-Indian (and a touch of Sri Lanka) restaurant gives you throughout your meal. 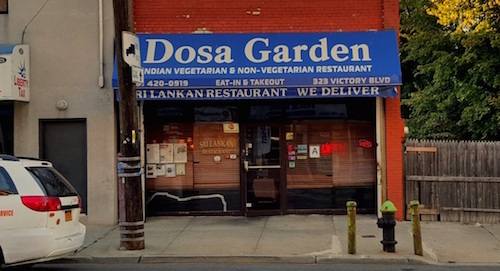 They offer a wider variety of interesting South Asian items, room to explore what you have not had at an Indian restaurant yet. We decided to stick to smaller items and appetizers so our party of three could try more things. Fittingly, the medhu vada ($4, 3 pieces) came first as this is more commonly a breakfast item. This "donut" was moisture than our version, and served with a spicy sambar</> sauce and two chutneys. We gravitated towards the sambar, but probably would choose the chutneys had it been breakfast. The next appetizer to make its way to our table was the paneer pakora ($6, 6 pieces), which was simply deep-fried cheese, good in any language. With the spicy mint sauce, these we one of personal favorite parts of the meal despite it pleasing the others as much. Between courses, we were entertained by the Bollywood hits on the flatscreen in the back, and I was able to enjoy the decor of all yellow light bulbs (excuse the photos). We next were treated to the most interesting dish of the night, but probably the least appetizing. The puttu ($5.50) is steamed rice flour, salt, and coconut, served in a cylindrical mould, but lacks any moisture. We had to dip it in any sauce available. We next wanted to try one of the utthappams, and decided on the onion and tomato version ($5.50), keeping our night vegetarian. This "pancake" was very moist and again served with the sauce trio. We again dived into the sambar, and enjoyed this dish partly because it was good and partly because the previous one was not liked. When the mysore masala dosa ($5.50) we ordered arrived (it would be unthinkable not to order one in a place called Dosa Garden), we all tore a couple pieces around the edges before losing our shyness and diving into the main "meat" of the dish and literally tearing it apart and devouring it. Our last item, like the puttu, was also from the "Sri Lankan Specials" portion of the menu, and was probably brought out last because of its sweet nature. The Idiyappam ($5) was tiny rice noodles served with a hot coconut sauce, that we gobbled up despite reaching our limits. Even though our waiter was a little too attentive asking for conformation of our delight on every dish, all in all, we were happy, and with ample time did not mind the long ride out to Staten Island on this Saturday evening. I even walked across the street to purchase some pastries from the lovely Sri Lankan cafe I can never come to this island and not visit. Maybe have a tag with score...so we can find 5.0 food very easily.